The BMXie balance bike doesn't compromise : a real BMX-styled bicycle frame, oversized tubing but extremely. lightweight. Superduper cool design, adjustable seat without tools and a removable footrest. Need anything more ? Maybe a detachable front number plate with various stickers ? Got it ! This is probably the coolest balance bike in the world ! Airless RubberSkin tires are a new kind of tires that give you the best grip possible, and you don’t even need to inflate them. A foam core means they cannot puncture; an outside rubber layer makes them just like rubber tires, unlike other foam tires on the market. Great grips and no pumps – that’s best of both worlds. 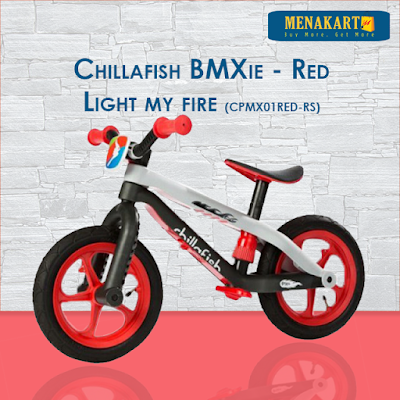 Exactly what every Chillafish balance bike needs.